If you’ve spent any time reading about boardgames on Reddit, Twitter, or Boardgamegeek, you’re likely familiar with a game called Concordia, from designer Mac Gerdts. If you haven’t already played it, you’ve likely looked at pictures of the game and the box and questioned the sanity of fans. Unless you’re crazy like us, and get turned on by old maps and the colour beige, you’ve thought to yourself “Not in this lifetime!”. Mac Gerdts has been around the block. He may be most famously known for his series of games that explore the rondel mechanic. A rondel is a wheel shaped mechanism, usually printed on the game board, with a variety of options and rules for movement. Gerdts played with this in Antike, Hamburgum, Imperial, and Navegador. In 2013, he took a new approach with Concordia and used cards in place of the rondel, a twist he continued toying with in his 2017 follow-up game, Transatlantic. 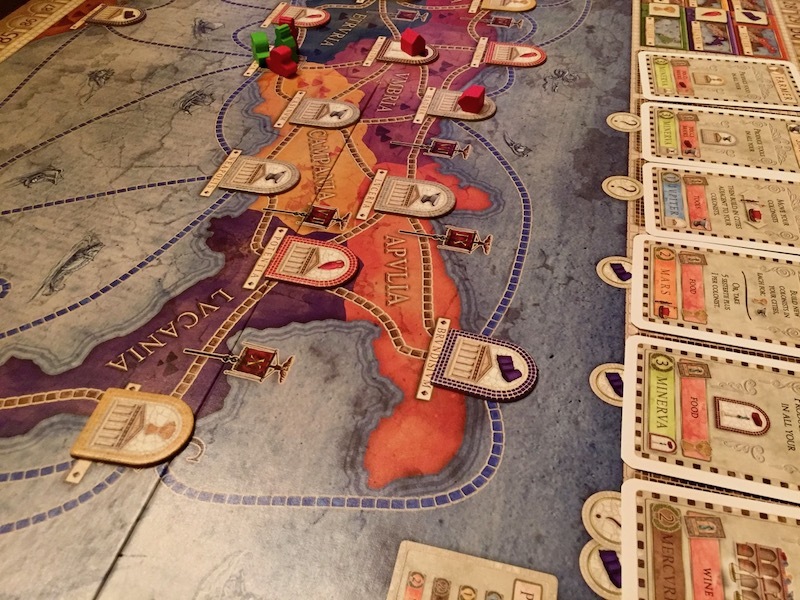 Concordia is still thematically a “trading in the Mediterranean” game at heart, but the cards and a minor twist in how they play and accomodate scoring was all Mac needed to create something fresh and exciting. 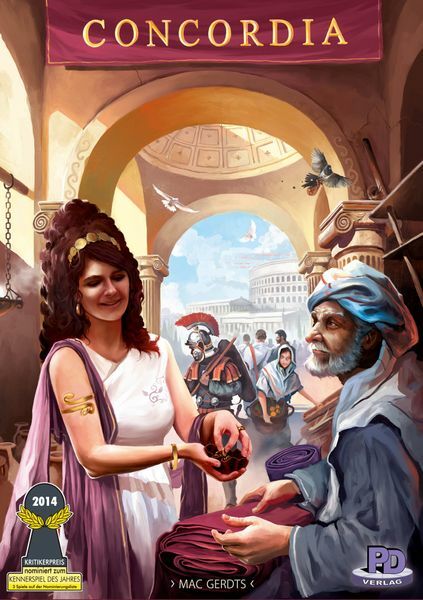 Concordia is a peaceful 2-5p strategy game from designer Mac Gerdts and publisher PD-Verlag, released in 2013. It’s a card-drafting style boardgame with point-to-point map movement and a dash of deckbuilding. The game has players take the role of merchants in the Mediterranean during the age of antiquity. It has a variety of maps that scale the experience, so it plays well (depending on the map) at all player counts. Admittedly, that box may not be as fresh or exciting as the contents are. Fine. I happen to think it’s not the worst box that’s ever existed, but it certainly doesn’t appear to be doing much for inspiring enthusiasm in Concordia. It’s perhaps for this reason that Concordia has largely been a sleeper hit. Despite being nominated for both the 2014 Jogo do Ano and Kennerspiel des Jahres awards, and winning the Meeple’s Choice award, its popularity with gamers took extra time to build, with most of it’s success due to Shut Up & Sit Downs glowing recommendation last year. So what makes Concordia so good? To start with… the game is surprisingly easy to learn, with a single double-sided page of rules. Ready for a high-level rundown? Each player gets a small player board with some wooden pieces, and a personal deck of a half dozen cards that match the deck of cards of other players. Each turn you will play exactly one of these cards, which will give you the ability to perform that action. Once you play a card, it goes to your discard, where it stays until you play the card that lets you reshuffle your discard pile back into your hand. This decision of when to reshuffle is fairly core to the game. The more cards you can play without playing the reshuffle option will earn you a big money bonus when you do finally recover your cards. On the other hand, the smaller your hand grows, the fewer options you have to play. This is the Concordia tightrope walk. The balance and pacing that you’re trying to achieve. You’ll be constantly planning out your hand to find the most effective order in which to play all (or at least most of) your cards before having to reshuffle. Colonist: Place new colonists or collect money. Mercator: Receive money and trade goods back and forth from the bank. Diplomat: Copy another players last played action. Senator: Buy up to two cards. Consul: Buy one card for cheap. Tribune: Recover all your played cards. Get a bonus for more cards recovered. Specialists: Produce goods in all houses of a certain type. Aside from your starting hand, you’ll also be buying new cards from a card marketplace that will boost your hand, giving you more and better actions to take on your turn, but also giving you points, or more accurately… point multipliers. You see, these cards don’t just behave as the above actions, they also form the basis of how you’ll score points at the end of the game. Blue Jupiter cards (like the Architect or the Diplomat) mean you’ll get 1 Victory Point for every city you build on the board, but two blue Jupiter cards mean you’ll get 2 Victory Points for each of them, and so on. But a few more, and you may be scoring a lot of points for every city you’ve built – and this might define your game. Build cities! This point scoring system is perhaps the most obtuse and difficult to learn part of the game. Players will typically spend their first game trying to figure out the scoring, and how it all ties in. Once they do, they’ll begin to develop clear ideas of how to approach the game and build strategies that might earn them more points, or how to adjust their strategies if they aren’t getting the cards they need. The reason it takes a bit of extra time to understand this multiplier scoring system is because it’s not clear as you play. Scoring isn’t tallied until the end of the game, at which point you may end up wondering why all those colonists you built didn’t net you all the points you expected, or why owning a controlling presence in all the high-value Cloth cities didn’t win you the game. The upside? This subtle scoring mechanism builds in some wonderful nuance. Your path to victory is going to be at least partially different than everyone else’s path, defined by your play on the board and by the cards you purchase. Since cards are visible to everyone (there’s no hidden information in Concordia) perceptive players will be able to identify opponent trajectories and attempt to stymie or slow them down. Though this isn’t critical to winning, ignoring your opponents decisions is usually a mistake. Everyone I’ve introduced to Concordia has enjoyed the experience. It’s one of the “simple ruleset, deep choices” games that I find myself increasingly drawn toward these days. I don’t care to spend a lot of brain power learning how to play, but I absolutely love spending it making game decisions. Concordia has had a slow rise to stardom, but it now sits comfortably in the upper half of the BGG Top 100 (#20 as of this writing, with an 8.1 average rating) and there are still expansions and new content coming out for it (mostly in the form of new maps). There’s Britannia / Germania, Salsa, Gallia / Corsica, Aegyptus / Creta, and a new “Concordia Venus” edition, which is probably the best starting point for anyone new to the game.